A new exhibition at Brown University uses archival material, music and first-person accounts to tell the story of the relationship between the black organizing tradition and the Civil Rights Movement. 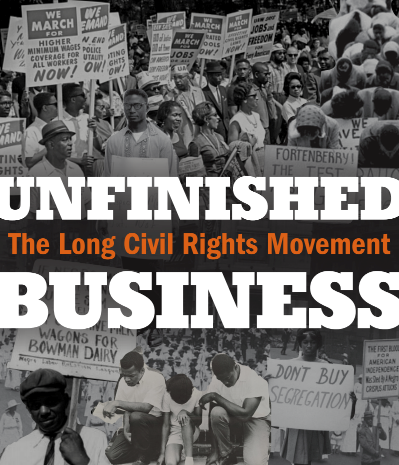 “Unfinished Business: The Long Civil Rights Movement” opened on Sept. 28, at the John Nicholas Brown Center for Public Humanities and Cultural Heritage (JNBC) Carriage House Gallery. Presented by the Center for the Study of Slavery and Justice (CSSJ) at Brown, it traces the black organizing tradition from the moment of emancipation until the 1984 and 1988 presidential campaigns of Jesse Jackson. Because African Americans were systematically prohibited from voting, voter registration campaigns included teaching the community how to pass literacy tests, read and fill out ballots. 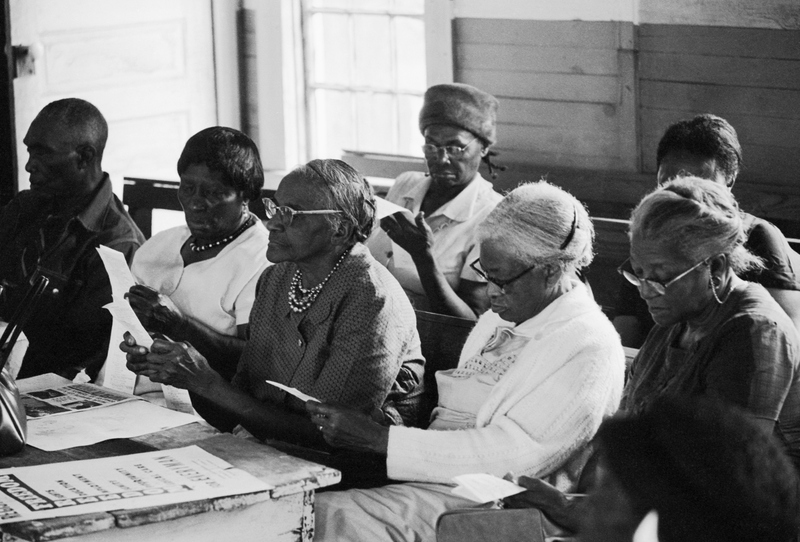 Here, a group of women are reading sample ballots during a class in an Alabama church. The Civil Rights Movement was a catalyst for social change in America, disrupting the system of Jim Crow laws and racial segregation, Bogues said. The exhibition focuses on the ordinary black women, men and children who often risked their lives to fight the laws that enforced racial segregation. Bogues said the exhibition was inspired by the 1968 Black Student Walkout at Brown University, which will reach its 50th anniversary later this fall. The Walkout began on Dec. 5, 1968, when 65 of the 85 black students enrolled at Brown marched down College Hill to Congdon Street Baptist Church. It concluded four days later, after the students successfully negotiated with Brown leaders for increased social, academic and financial support for black students. The exhibition includes a broad range of images, including photographs of the 1968 Walkout at Brown; a photo of the members of the first South Carolina legislature after the Civil War; photographs taken when white mobs attacked the blacks in Tulsa, Oklahoma, in 1921; images from the 1955-56 bus boycott in Montgomery, Alabama; and many others. It also includes a soundscape given the integral role music and song played in the black freedom struggle, Bogues said. Accompanying the exhibition is a 109-page catalogue including essays by activists, journalists, scholars and others and provides further historical perspective on the Civil Rights Movement. Among the contributors are Student Nonviolent Coordinating Committee member Judy Richardson, founding member of the National Association of Black Journalists Charles E. Cobb Jr. and Brown President Christina Paxson. A public reception at the gallery will be held from 4 to 6:30 p.m. on Sept. 28, the opening day. The exhibition will remain on view through Dec. 14, 2018. The JNBC Carriage House Gallery is located at 357 Benefit Street in Providence. Gallery hours are Monday to Friday from 10 a.m. to 4 p.m. (except holidays). School and community groups who wish to schedule a visit or tours can contact the CSSJ at cssj_youthprograms@brown.edu.